When I was getting ready to get the dogs fed last night, My Guy sent me a message to tell me that his program had blown up and that we wouldn't be able to chat, but just FYI, they were having a partial eclipse in Iraq and maybe we were also. I was super bummed that we weren't going to be able to chat, but how cool is it that My Guy thinks of photo ops for me!? 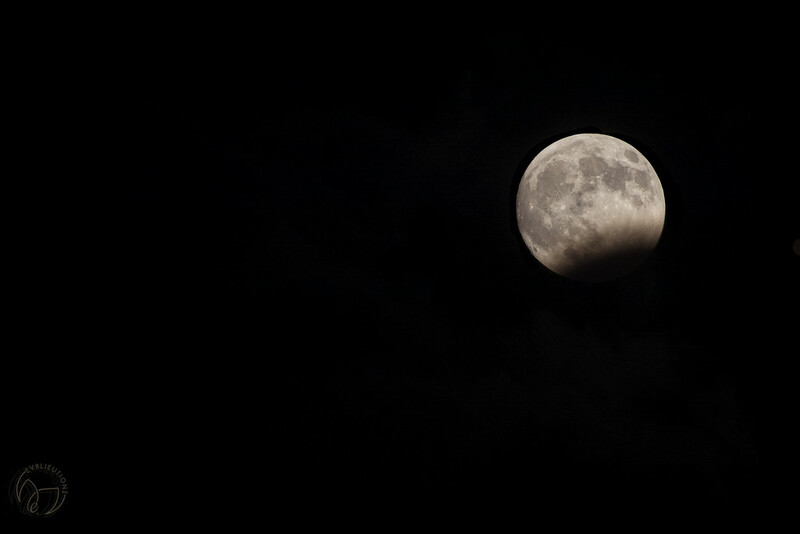 The moon came out of the clouds just in time for me to catch the partial eclipse then went back behind the clouds. Once again, my chubby cheeks changed the settings on my camera so the file quality was not what I like to have it set to. WHEN will I learn to check these things!? It is hard to remember settings when you get super excited!!! I have two settings that I forget to undo and drive me crazy next time I go to shot. The first is braketing. SInce every shot changes the shutter speed it is hard to get the speed right if you forget to turn off the bracketing. The other is the +/1 button. I blame it on my sometimers. I love this, simple but rather wonderful detail in the moon. Fav! As for the remembering to set white balance, exposure, clean lens, have memory card inserted with a full battery continues to plague elude me-OFTEN! Your photo is better than any I have seen so far in the media! This is amazing - such a unique photo - great capture. @joansmor Thank you very much! I am glad I am not the only one! @joysabin Thank you so much! It's good to know that I am part of an awesome club! @maggiemae What a sweet thing to say; thank you! @laetitiapetrussa Thank you so much! @cmsch52 Thank you very much! @gaylewood Thank you so much!